When you need one machine for everything from ceiling to floor, go with a canister vs upright. Here are Meile Canisters at F & H Vacuum Repairs in San Francisco. Meile’s well-engineered, and built to last. Sanitaire Upright Commercial machines at F & H Vacuum Repairs in San Francisco. I haven’t tried this brand. Healthy home experts have their mantras. One is “Vacuum frequently with a HEPA vacuum”. That’s especially important if you have allergies or asthma. Or living with toxic dust like flame retardants (too many of us). But too often, they don’t say how much extra work it all is (alot!). Or the advantages of canister vs upright vacuums. Got big carpets areas to vacuum, and not much else? Either type of machine will work. Many people find uprights simpler to use, but go with your own preference. I prefer a canister, for carpets, myself. But if your home has lots more than carpets, you’ll get more bang for your buck with a canister vs upright. With a canister, you can hit everything from ceilings to floors. And tight spaces everywhere. Carpets, too. Here’s what’s the same, and what’s different, between a canister vs upright. And why you probably need a canister. All uprights, and some canisters, come with a rotating brush for carpets or rugs. Upright brushes are powered electrically, of course, while canister brushes are powered electrically or by airflow. Canisters and uprights both come with a hose, along with a wand and tool attachments for different tasks. Standard attachments often include the following. Hard floor tool, for hard floors and walls. Crevice tool, for nooks and crannies. And, of course, crevices. Round brush, for dusting window frames, shutters, and much more. Look for even more attachments from various brands. You’ll even find some for vacuuming blinds, pets, and inside your car. And much more. Some people believe that an upright does the same job as a canister. That’s sort of true for wide-open carpet areas. But not so for using attachments. Here’s why. Meile canisters are popular among my health-minded customers. Along with using HEPA, Miele’s many efficient features make detailing a breeze. With a canister, you can make better use of your attachments. That’s because the hose is longer, more flexible, and better positioned than on most uprights. That means you can efficiently reach small spaces. And even vacuum above waist level. And not only that. With a canister, you can switch from floors to dusting— and back again— almost seamlessly. No stopping to attach a hose first, as with an upright. Then there’s the noise level. If you prefer a quieter machine, go with a canister vs upright. Check out my brand recommendations in my blog post, Finding Vacuums for my Healthy House Cleaning Service. Got big carpets areas to vac, and not much else? In the canister vs upright debate, either could win. Many find uprights simpler to use. But I still prefer canisters, which are far better at detailing, and easy enough to use. Here are a few Miele uprights at F & H Vacuum Repairs in San Francisco. Uprights are designed for wide-open carpet areas, not for using attachments. Think wide hallways with wall-to-wall carpet. Or your carpeted living room, if your furniture’s spaced far enough apart. Here’s the beauty of an upright. When vacuuming without the hose or attachments, there’s nothing to tug along behind you, as with a canister. However, every time you switch to attachment mode, you must stop to attach the hose first. Also, you can’t tug an upright around by the hose like you can with a canister, because the machine will tip. So, when detailing surfaces throughout a room, with the hose attached, you must continually backtrack to get the machine. Got wide-open areas of carpets and rugs, and not much else? If you already have an upright, you may as well keep using it. A canister works fine, too, as long as there’s a rotating brush attachment. A rotating brush works far better than suction alone. If you have heavy-duty mats in your kitchen or entrance, check the manufacturers’ recommendations. For softer materials like fabrics, use a hard floor tool attachment. If that doesn’t work, try an upholstery nozzle. Remember, attachment mode is easier with a canister vs upright. Of course, you can launder some cloth mats. Or shake them outside, weather permitting. However, shaking is likely to expose you to more dust than vacuuming. That’s especially important if you have allergies or asthma. Never mind if your dust is contaminated with lead, flame retardants, or other toxics. 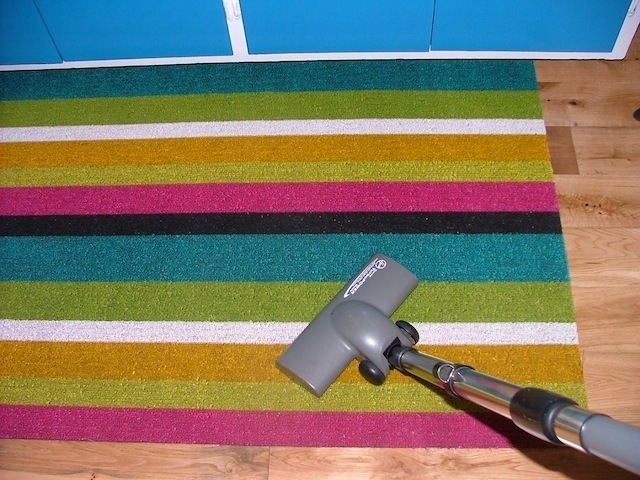 Vacuuming a kitchen mat with a turbo brush attachment. This air-powered, rotating brush works well on low-pile rugs. The underside looks a bit like the brush roll on an upright. 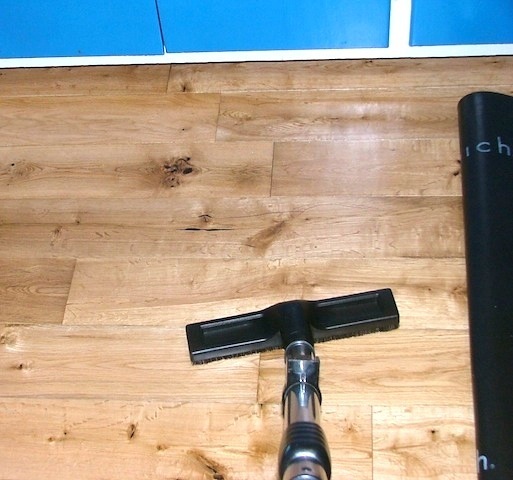 Using a hard floor tool is easier— and smoother— with a canister vs upright. Agile and nimble are words that come to mind. Especially in smaller spaces and corners. Vacuuming under the same kitchen mat. This time, with a hard floor tool. An upright, on the other hand, is too clumsy for use on hard floors. But if you need to use an upright in a pinch, turn off the motorized brush roll (on all uprights), so you don’t scratch the floor finish or scatter debris. With some uprights, you may also need to select a floor height. You’ll need to use tool attachments. That’s easier with a canister vs upright. Details includes the following. A canister’s easier to maneuver on stairs than an upright. Especially when detailing edges, corners and vertical spaces that call for attachments. Detailed vacuuming involves plenty of above-the-floor surfaces. Here are a few examples where a canister comes in handy. Canisters are far more agile on above-the-floor surfaces than uprights. Here I’m vacuuming a wall with a Miele extending wand and hard floor tool. Nature photo by Emil Flock, a nature and industrial photographer, and long-time customer. Click on the photo for more of Emil’s work. What’s your own your experience been with canisters vs uprights? Your comment just might help others.